It was a very nice SLOW summer week. I was able to catch up on everything that piled up while I was out of town. I received only one lesson for review but from the emails I have been getting I suspect more are on the way. Don't be shy about asking me to do a video for you if there is something you are having trouble with. I can always do one on pretty short notice. They tend to be a little too long to send via email so I have to post them on Youtube but if you have a problem with something, no doubt someone else will as well. 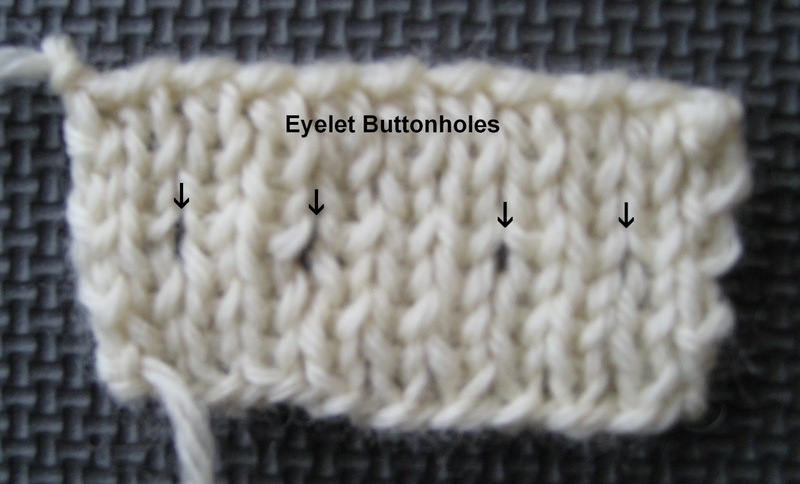 This week's tip is about simple yarnover buttonholes in ribbing. I thought I was finished with seaming but I figured out this morning I had skipped over seaming a horizontal (bound off) edge to a vertical (selvedge) edge. I'll do that next week. When you are deciding what type of buttonhole to work there are several factors to consider. It first has to be the right size to fit the button. Some types of buttonholes, like a simple eyelet, do not produce a very large hole. It also has to work with the stitch pattern. For example, you can work an eyelet buttonhole in garter and seed stitch but they can be a bit hard to see (and find). The good news is that they are very easy to make in most stitch patterns. Just YO, K2tog or K2tog, YO. It really doesn't make that much of a difference. The problem comes when you work this type of buttonhole in K1P1 ribbing. If you don't place the yarn over properly, the buttonhole can look really ugly. As always with anything in knitting, the goal is that the stitch pattern is not interrupted. 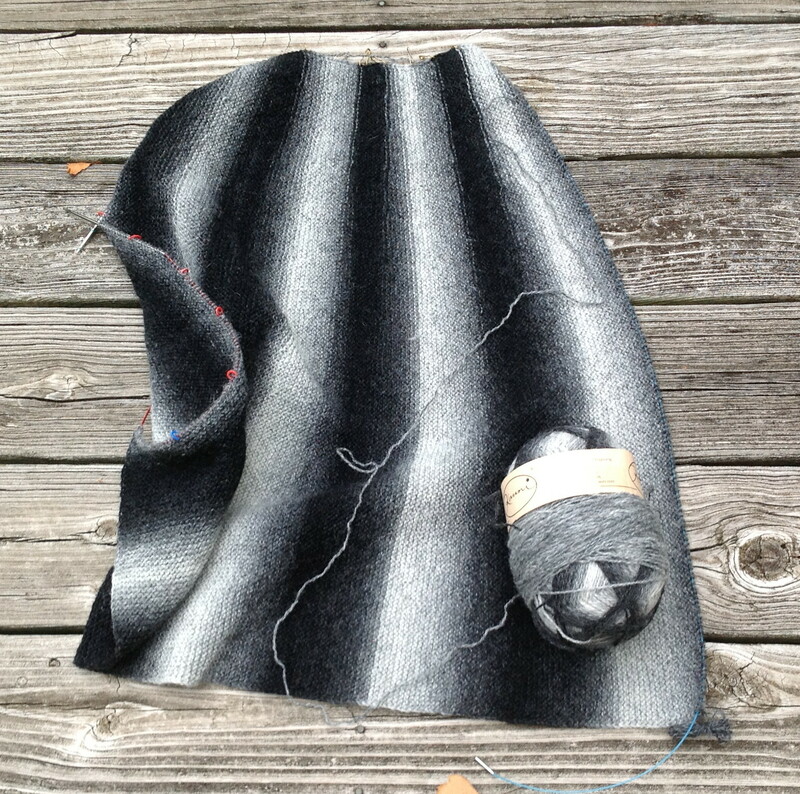 It will look better if you place the yarnover over a purl stitch and then use the correct decrease. If you look closely at the buttonhole below, you can see that there is a purl bump at the base. 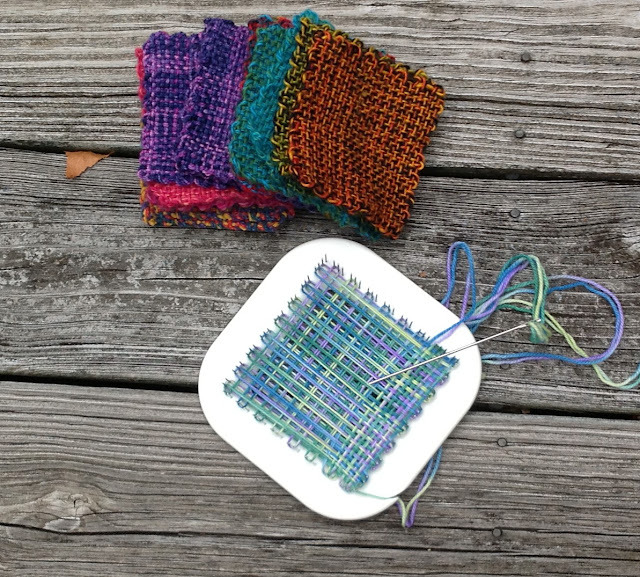 When you work any type of single decrease, one stitch will be on top of the other. 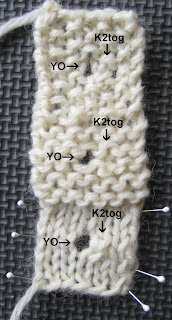 K2tog decreases place the second stitch on top of the first. 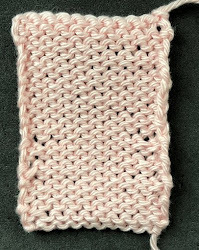 In this case, the second stitch is a purl stitch. SSK decreases place the first stitch on top. For this particular buttonhole, an SSK decrease would have worked better or the yarnover could have been worked first, the the K2tog. 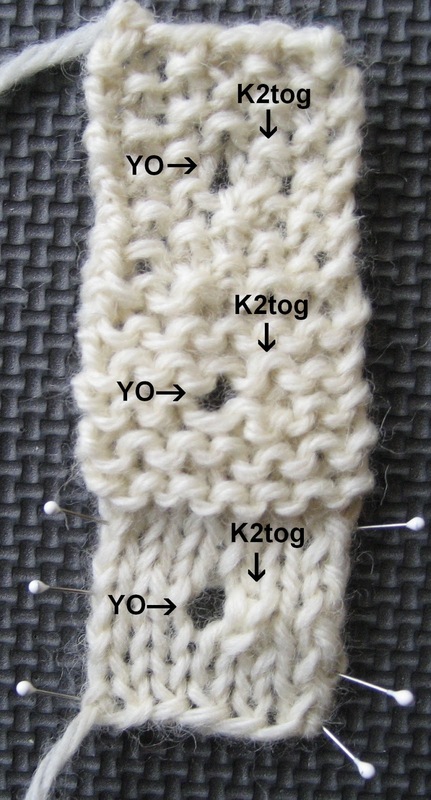 This photograph shows some eyelet buttonholes worked in K1P1 ribbing. Notice that the pattern has been maintained. The columns of knit stitches are continuous. If I had worked the wrong decrease, this would not be the case. Can you tell what type of decreases I used for each? Probably not unless you look very closely. I've stretched the swatch and labelled each type. It really doesn't matter which you use. The important thing is to select the decrease which will cover the purl stitch. Salon will be on Sunday this week as I have to drive up to the Cincinnati airport on Saturday. I got the photograph from the photo shoot last week of my coat. I think it turned out very nicely. I hope they use it in the magazine. At TNNA, Schact Spindle Company had distributed their new product, Zoom Loom to all of the yarn companies. Most put some of their yarn on the looms which was very intriguing. They sent one to Penny to be reviewed and I took it home with me to try out. I have had so much fun using up leftover sock yarn. I have no idea what I am going to do with all of these squares. They are the perfect size for coasters. Since my surgery I like to vary what I do with my hands. I've had so much fun I bought a Cricket Loom last weekend. I managed to warp it with no problems but I am such a perfectionist I can see that what will drive me crazy is developing a consistent looking fabric. The yarn they sent with the loom really shows you how inconsistent you are...bright red and blue. I am having fun with it. I have had time to work on my skirt. I'd love to finish it in time to wear to the meeting in Charlotte. We shall see. I do like it but I am not wild about the white stripes. I think it has a "Pepe La Pew" feel to it (for those of you who love Looney Tunes like me). The skirt will be so full that I think the drape will mitigate this so I will continue on. The Zoom Loom looks to be just like the Weave-Its from several decades ago. A local woman is putting together a book of patterns - anything from baby blankets to stuffed animals. Piecework (Spring 2010, give or take an issue) had an article by Robin Hansen about them. It looks like a blanket made from the squares would be utterly delightful. It sure wouldn't grow like garter stitch!